Definition at line 34 of file CObjectLists.h. Definition at line 118 of file CObjectLists.h. Definition at line 38 of file CObjectLists.h. Definition at line 557 of file CObjectLists.cpp. References CModelEntity::FIXED, CModel::getMetabolites(), and CCopasiVector< T >::size(). Definition at line 571 of file CObjectLists.cpp. References CCopasiVector< T >::begin(), CCopasiVector< T >::end(), CKeyFactory::get(), CModel::getEvents(), and CCopasiRootContainer::getKeyFactory(). Referenced by getListOfConstObjects(), CMathContainer::initializeObjects(), and CModel::isStateVariable(). 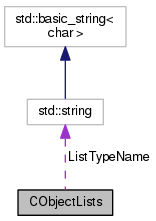 Definition at line 117 of file CObjectLists.cpp. References CArrayAnnotation::addElementReference(), ALL_INITIAL_VALUES, ALL_LOCAL_PARAMETER_VALUES, ALL_PARAMETER_AND_INITIAL_VALUES, ALL_PARAMETER_VALUES, ALL_VARIABLES, ASS_COMPARTMENT_VOLUMES, ASS_GLOBAL_PARAMETER_VALUES, ASS_METAB_CONCENTRATIONS, ASS_METAB_NUMBERS, CModelEntity::ASSIGNMENT, CCopasiVector< T >::begin(), COMPARTMENT_INITIAL_VOLUMES, COMPARTMENT_RATES, COMPARTMENT_VOLUMES, COMPARTMENTS, CONST_COMPARTMENT_VOLUMES, CONST_GLOBAL_PARAMETER_INITIAL_VALUES, CONST_METAB_CONCENTRATIONS, CONST_METAB_NUMBERS, CArrayAnnotation::dimensionality(), EMPTY_LIST, CCopasiVector< T >::end(), CModelEntity::FIXED, CKeyFactory::get(), CModel::getCompartments(), getEventTargets(), CCopasiRootContainer::getKeyFactory(), CModel::getMetabolites(), CModel::getModelValues(), CCopasiContainer::getObject(), CCopasiObject::getObjectParent(), CModel::getReactions(), CCopasiParameter::getValueReference(), GLOBAL_PARAMETER_INITIAL_VALUES, GLOBAL_PARAMETER_RATES, GLOBAL_PARAMETER_VALUES, GLOBAL_PARAMETERS, METAB_CONC_RATES, METAB_CONCENTRATIONS, METAB_INITIAL_CONCENTRATIONS, METAB_INITIAL_NUMBERS, METAB_NUMBERS, METAB_PART_RATES, METAB_TRANSITION_TIME, METABS, NON_CONST_COMPARTMENT_VOLUMES, NON_CONST_GLOBAL_PARAMETER_VALUES, NON_CONST_METAB_CONCENTRATIONS, NON_CONST_METAB_NUMBERS, CModelEntity::ODE, ODE_COMPARTMENT_VOLUMES, ODE_GLOBAL_PARAMETER_VALUES, ODE_METAB_CONCENTRATIONS, ODE_METAB_NUMBERS, CFunctionParameter::PARAMETER, REACTION_CONC_FLUXES, REACTION_METAB_CONCENTRATIONS, REACTION_METAB_NUMBERS, REACTION_PART_FLUXES, CModelEntity::REACTIONS, REACTIONS, REDUCED_JACOBIAN_EV_IM, REDUCED_JACOBIAN_EV_RE, SINGLE_OBJECT, CFunctionParameters::size(), and CArrayAnnotation::size(). Referenced by CMathContainer::allocate(), getListOfObjects(), and CMathContainer::initializeObjects(). Definition at line 97 of file CObjectLists.cpp. Definition at line 98 of file CObjectLists.h. Referenced by SensWidgetComboBox::fillFromList(), and CSensItem::getListTypeDisplayName().